I also plan to build a better "Showtime 100" than my 1980's effort using the SWS F-4J and Eduard Mk20's. Is your project also about "Showtime 100" or is that just in the thread title because the SWS kit comes with these markings? Do you plan to use decals from the Furball sheet for F-4B's on this kit? Although I hope that Furball will do a couple of "Julliet Mig killer" sheets, I had a look at the SWS kit decals. I don't see anything wrong with them and they are Cartograf printed. About the only thing I'm uncertain about, is whether on the 10th of May 1972"Showtime 100" had that Mig silhouette in the black triangle on the tail, or just the solid black triangle. The other thing I don't know is if "Showtime 100" had the empty outer wing pylons fitted. I have the Hypersonic pieces, but for the moment I figure they were not on the aircraft that day. This build is all about the aircraft! 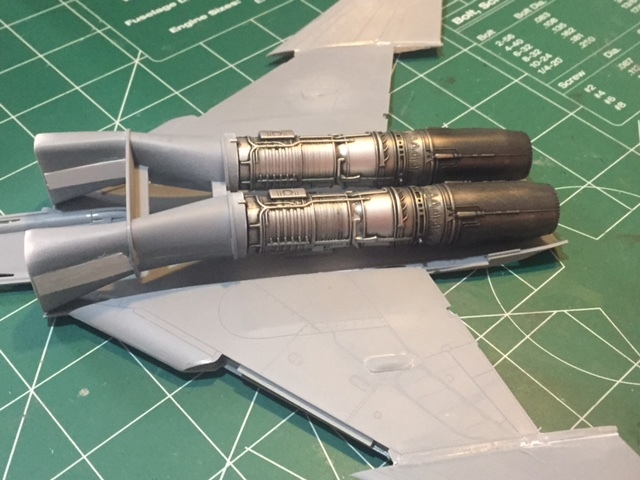 I'm also building another famous F-4 right now that served in the Air Force. F-4C 64-0776 was the only Phantom during Viet Nam that scored kills with all three of it's weapons systems, AIM-7, AIM-9 and SUU-23 Gun Pod. Been wanting to do "Showtime 100" for a while now and with the release of the SWS kit, I figured now is as good a time as any. I am going to use the kit decals for my build. You're right they are printed by Cartograf and are excellent. The only markings that I will use from the Furball sheet are the kill markings that are going on the splitter plate. I will remove the MiG-21 silhouette from the markings that are on the vertical stab, by either painting over it or I will just paint that triangle part of the marking, and place two kill flags to make the markings correct as it was seen on 10 May 72. As for the outboard pylons, my understanding is that the pylons were on the aircraft but were empty, so that's why I chose the Hypersonic pylons. 2 AIM-7E Sparrows in the aft wells, 4 AIM-9G's and 6 Mk 20 Rockeye CBU's on the inboard pylons on TER's. With the outer pylons present but empty. I think this is going to be a really fun build and cant wait to get started....pictures of the build to follow! I have had a look at the Osprey book on USN F-4 Mig killers 1972-73 this afternoon. There are a couple of photographs of 155800 in there. I now believe that the outer pylons are present, but empty like you said. The mig silhouette remains a bit curious, there are pictures of 155800 with and without it...all captioned as being from the 1971-72 cruise. My gut feeling is that they started the cruise without them but the silhouettes were applied to the VF-96 aircraft pretty close to May 72. The photograph of 155800 specifically captioned as being from the 29th of March 1972 is without silhouette. Thank so for the info Stefan! I'll check it out. Go Brad!!! I'll be watching....I have a few of these but haven't started them. Last edited by Hornet18; October 9th, 2017 at 02:50 PM. Thanks Andy, I hope that this is a fun build.....after all the good things that were said about the kit, I had to get my feet wet with a NavAir subject! Thanks Jeff, I'm really looking forward to SWS's F-4C release, that's the one I'll grab several of! Well the work on Showtime 100 has begun......started on the engines and intake trunking. 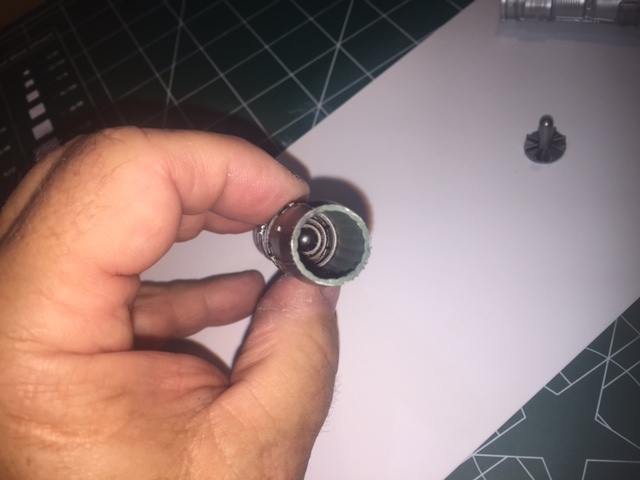 Just a heads up there are injection pins all with way through the intakes, both top and bottom that will need to be addressed if you are going to show the intakes open without a plug! 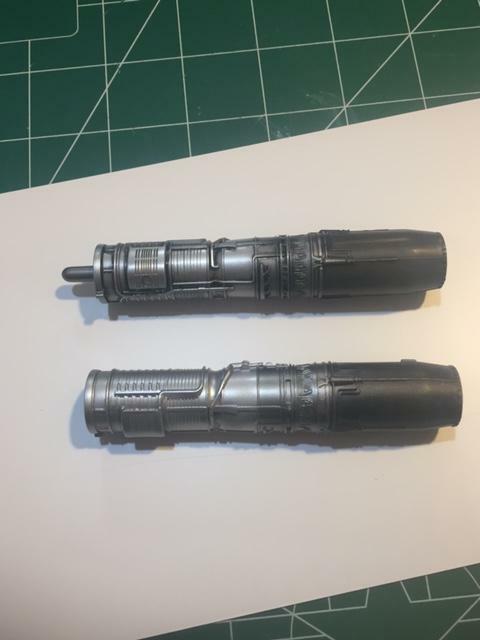 Here are the two J-79's painted.....one with a black wash and one without. I am also used the Brassen Exhaust nozzles for this build. Here is what the afterburner looks like......really nice detail in this set. Also wanted to show what the front of the engine blades look like in the intake. That's it for now. 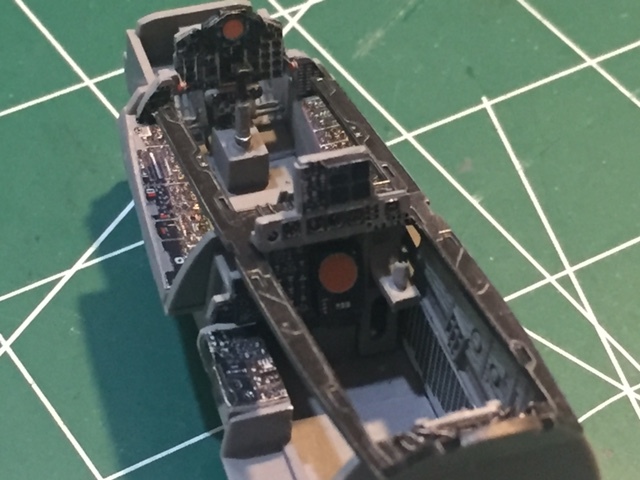 Starting on the cockpit. 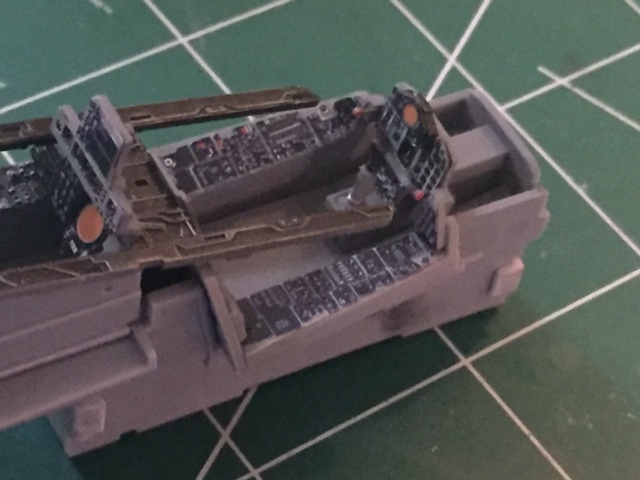 I will be using the kit cockpit, but enhancing it with the ZM photo etch set and Wolfpack ejection seats. More to come. Very nice work on the intakes. I find these ejector pin marks hard to reach inside the narrow intakes. Luckily, I don't look into the intakes of my own models a lot. 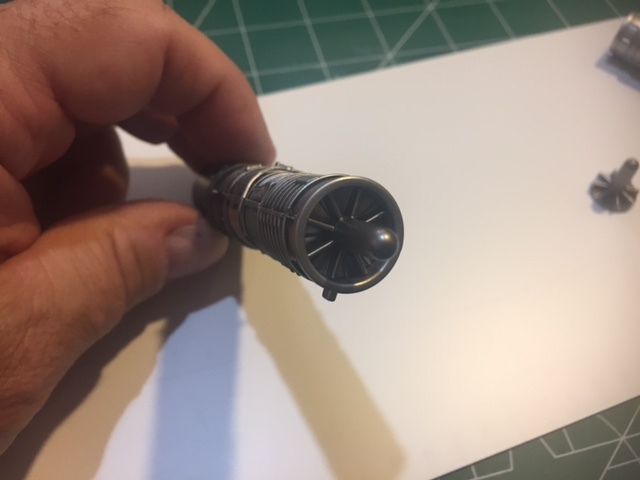 I'm with you Stefan, I usually use intake plugs on my USAF jets because I hate dealing with them, but on the NAVY jets I don't see them use a lot of plugs so I decided to show the intakes all the way to the fan blades. Those aren't the only Ejector pin marks you will have to deal with on this jet. Landing gear doors have them too! I guess after all the hype on this kit, I expected a little more. Don't get me wrong, it's still a great kit! 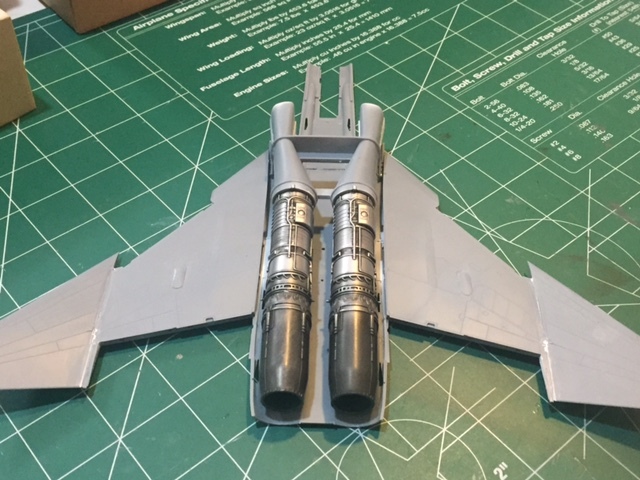 Engines are on the intake trunking and mounted to the bottom of the fuselage.......some thing that I forgot to mention on the intakes. 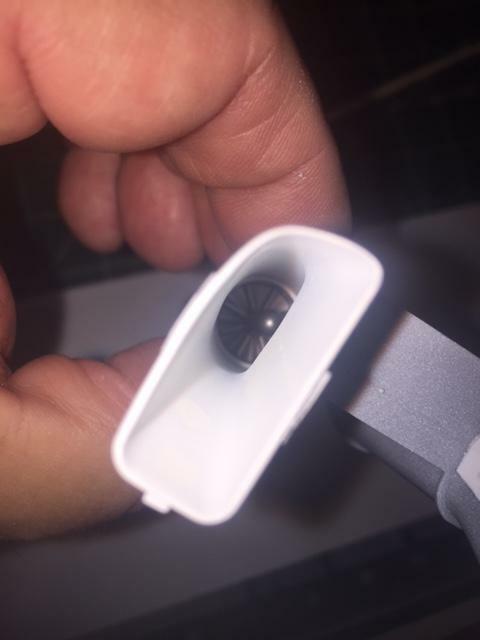 The plastic is thinner for the forward part of the intakes, both top and bottom and when I was sanding my putty to get them smooth inside, I kept cracking them. So I cut some evergreen plastic strips and glued them down the seam on the outside of the intakes to strengthen them so I could complete the sanding.....worked perfect. 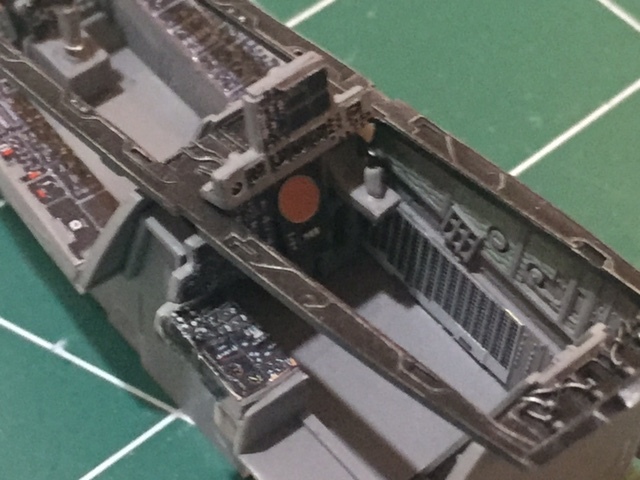 Most of the work on the cockpit is complete. I used the kit pit with the ZM photoetch set and it certainly looks the part to me. Working on the ejection seats and should have them done soon. I'm using the Wolfpack Martin-Baker Mk 7 seats. Fit is perfect so far. More to follow. Welp, I know which kit I'm pulling out of my stash when I finally move into my new house. You're going to love this kit. So far everything is fitting very well.......but, be prepared to fill/repair ejector pin divots in the intakes and gear doors! Nothing that can't be fixed, but I wasn't expecting them on a 90.00 dollar kit! 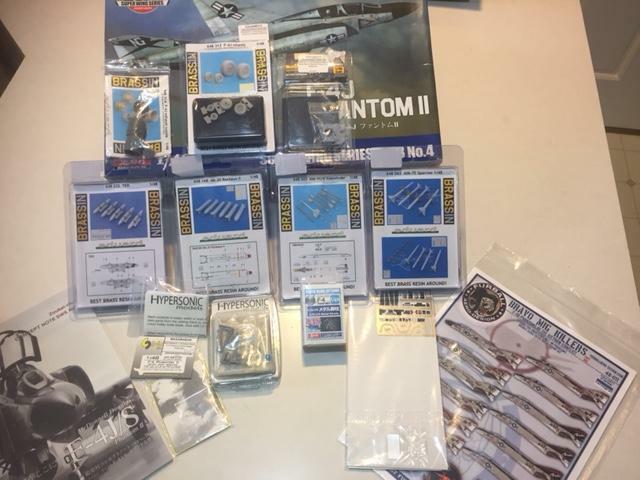 Overall no complaints so far or at least nothing that will keep me from buying this kit again......as a matter of fact getting ready to order two of the F-4C's as soon as I get my bonus check! Awesome job so far! Just a heads up as I made the exact same mistake. The parts Z-M have you use for the aft instrument panel are incorrect. 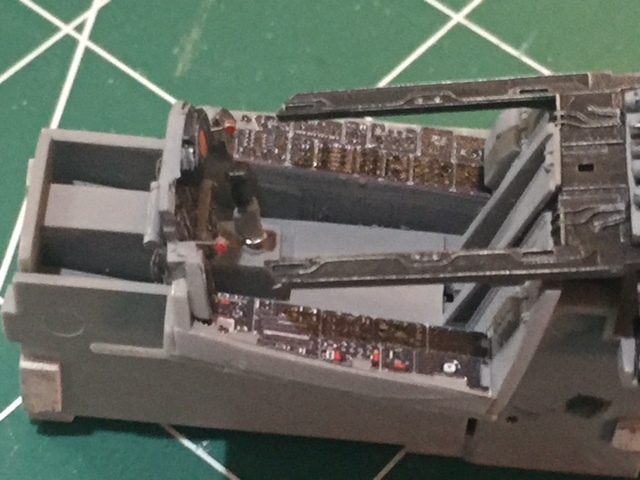 What you have installed (and what I had installed) are the aft cockpit parts for the F-4B/N. I didn't catch it until I started painting. Here is a short video I posted on my Facebook page regarding the mistake. Hopefully this link works. Good catch, Dave! I'm jonesing for one of these but already have too much stuff stacking up to build and work has kept me away from home for weeks now.